The News & Observer’s (Raleigh, N.C.) series Meet Farmer Joe focuses on a husband-and-wife team. (And I always ask when I see this series: What about Farmer Josephine?) Both are also ordained ministers. Read more here. Readers offer their ways to eat quick, fast and health in Kathleen Purvis’ blog at the Charlotte (N.C.) Observer. Get the recipes and more here. A man, a goat and the search for perfect cheese. Sound like a movie plot? Well, it is. Read more in the Winston-Salem (N.C.) Journal, here. Let’s get small…. And if you recognize that line, you’re probably too old now to stay awake long enough to see the TV show it came from. But I’m talking about watermelons. You must have noticed they’re tinier, even down to “personal size” watermelons. I guess “personal size” depends on one’s definition of a serving. Anyway, the New York Times explores the incredible shrinking watermelon here. If you’re cuckoo for Locopops, the exotic takes on Mexican paletas that have fed Triangle sweets lovers for years, you’ll like The News & Observer (Raleigh, N.C.) today. This article features the company and its founder, and how she has found that small is beautiful. And she’s so creative – one spring, I purchased haroset-flavored pops there. The fleeting nature of summer’s goodness is Kathleen Purvis’ theme at the Charlotte (N.C.) Observer. Read here, and savor your cantaloupes while you may. Five years since the state limits on alcohol levels in beer were lifted, the Triangle is in a brewery boom. Find out what’s happening and why that repeal matters for good beer in The Independent (Durham, N.C.) here. A new study says that the Winston-Salem – Greensboro – High Point area is tops in the country for consumption of fast-food breakfasts. And they ain’t ordering smoothies. Read more in the Greensboro (N.C.) News & Record, here. Guy Fieri. Don’t even get me started. Read the New York Times article about this large flash in a very large pan, if you must. The canning expertise of yours truly is mentioned in today’s News & Observer (Raleigh, N.C.) article on taking canning beyond the basics. Once you learn the important stuff – sterilized jars, pectin for jelling, etc. – it’s easy to branch out. I made some fig jam with vanilla and cinnamon this week. You can make jelly from virtually any liquid. Read the article here. Over at the Charlotte (N.C.) Observer, Kathleen Purvis sings of smoothies. The hub and I are hooked on them, too. And they make a good little sweet something in the afternoon or evening as well as a breakfast. I like almond milk better than soy (for the non-dairy hub), and I add a scoop of soy protein powder to up the protein and make the smoothie more filling. Read more here. 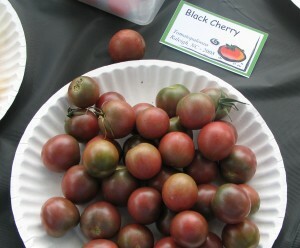 It’s tomato time, and the Winston-Salem (N.C.) Journal has a chef’s recipe for slow-drying them in the oven. Read more here. You can sass up your summer salad with ideas from the Salisbury (N.C.) Post. I never considered a salad stuffed in green peppers, but it’s certainly pretty. Read more and recipes here. Lunch may not be able to last forever, but it has lasted 30 years for a Dallas club. The Dallas Morning News has a story today of a neighborhood lunch club that has been going for three decades. Read more here.